BRANTFORD – Wilfrid Laurier University’s Yellow Brick Wall gallery at the Brantford campus features an exhibit titled From the Ground Up: Learning in Place. The exhibit runs from Nov. 6 to Dec. 20, 2017. From the Ground Up showcases the work of Brantford, Ont. resident Arlene Laskey, and features abstract acrylic paintings and mixed-media works. The exhibit reflects Laskey’s reverence for personally relevant landscapes, the events that occurred there and their influence on human relationships. Laskey’s concern for diminishing farmland is also evident in the exhibit. 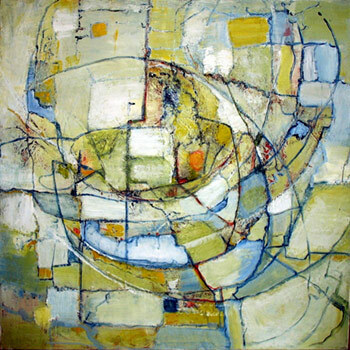 Her works possess map-like qualities with perspectives akin to aerial photography. Nineteen pieces of art are included in the exhibit, which features a colour palette reflective of Laskey’s respect for the rural environment: a spectrum of blues, greens, browns and ochres. Mixed-media works in the exhibit incorporate photographs of family members and friends who have significantly influenced Laskey’s life.